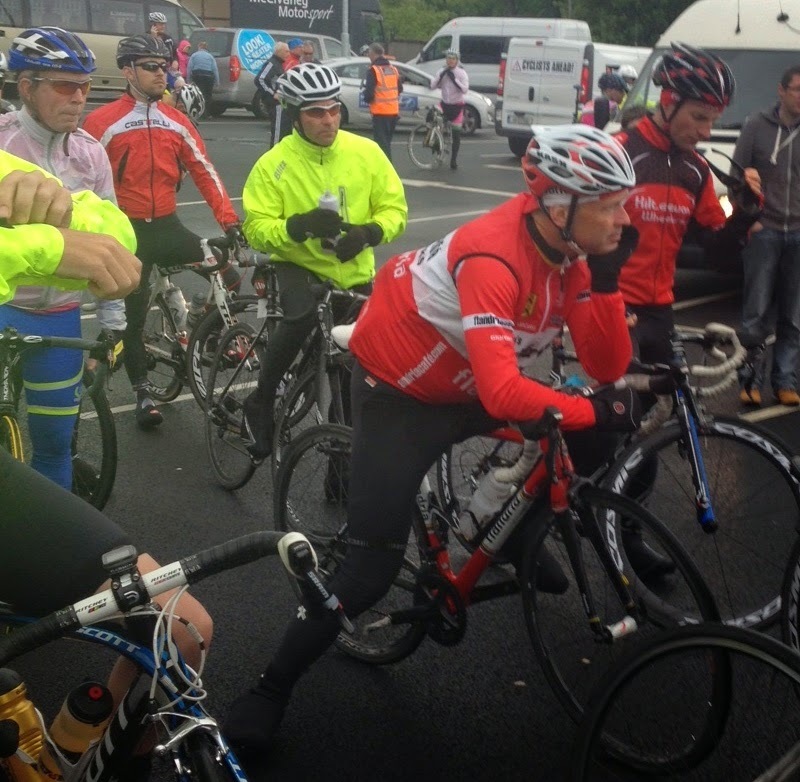 Day 7: Carrick on Suir - Baltinglass 147km. A gap too far. The mood around the Super Valu parking lot in Carrick on Suir this morning is somber. It's raining and cold. Again. My roommate Aaron McCormack got hit hard by that stomach virus last night. Staying up drinking with Alan seems now like it might have been the lesser of two evils, but not by much. "We shouldn't have drank so much, bad for the adrendal glands. I'd never have done that if we were racing." says Alan. Well, it's all more water under the bridge now amigo. I feel great this morning. Fired up. Get on the bike. It feels like there's no chain today. There's only one more big obstacle in the Ras. A 3 stepped climb up and over Mt. Leinster. As we're not doing the big Wicklow climbs this year, I've convinced myself this substitute won't be too bad. About 30 minutes or so of hard effort. With about 600 miles behind me, I'm getting cocky. I've avoided getting sick. My legs feel good, better every day in fact. The rain, my eternal ally, is not bothering me. And a week of rooming with two of Ireland's most storied cycling professionals has me believing I belong here, and all is possible. Mt. Leinster? No worries boys. Bring it on. Pints be damned. In constrast all around me it sounds like a consumption ward. Coughing everywhere. Faces as grey as the skies. We roll out of Carrick slowly. Very slowly. About 13-14 mph slowly. So slow the 'slower group' almost catches us. None of us want to ride hard before the mountain. A long warm up before the final challenge. Only the thing is, we can't warm up. It's pouring. Flippin' cold. A grey dog that looks like a greyhound darts out in front of the bunch, and before we have time to pull the brakes, he mercifully turns tail and just as quickly, darts back off the road. Disaster avoided. The peloton mood is like that in a prisoner cart being driven to the guillotine. It's pouring. At the pee stop I do the calculus and reluctantly put on my rain cape. I won't want it on the climb in about an hour, but I'm freezing cold now. I bide my time by counting down the time. The climbs start at 70k. We've been riding over 2 hours in now. Seems like we'll never get there. A watched pot never boils. Paul's advice for the climb is running through my head. "There's a steep one before Mt. Leinster. You've got to hang on on that, or you'll need to ride alone on the less steep but open slopes of the final climb to the summit." The final gauntlet is thrown. Got to get over the steep part with the group. We start climbing finally. Small gears, spinning nicely, feel good. Paul and Alan and a few others lead. I'm radar locked on Paul's rear wheel. We go up a long steep winding climb for what seems like a long time. No conversation, just concentration. It crests, and now we're on a short descent. Was that the steep one? That wasn't so bad. Now we're on another steeper one. This is harder, worse. Yes, this is Corabutt gap I'm told. I'm still on Paul's wheel, as he taps out a hard tempo on the front. I'm in a 34 x 21. I can hear Paul rythmically exhaling hard, like a boxer. Concentrate. It's pretty hard. Very hard. Christ, this is super hard. Houston, we have a problem. About a 400 meters ahead, the narrow path ahead of us ramps up even steeper, about 12% I'd guess, up a 1/4 mile wall to a right hand turn and still it climbs into infinity after that. It would be better if I couldn't see how much we have to come. Don't think. Just suffer. I'm starting to blow. Don't panic, try standing awhile, see if that helps. I dance to maintain the tempo, but it's not sustainable, I'm over my limit. Not an angel of the mountains, more an anchor. I've got to sit, got to let 'em go and give way, gradually at first. Christ, it's hot now. I'm frying in my impermeable sauna, sweating like a stuck pig. This friggin' rain cape. Going too slow to get it off. Screw this! I stop, pull it off and stuff it in my pocket. A little better, but it's all relative. Pulse shows 176. This is my limit. Only the vanguard is gone now, and more guys are trickling by me. Stuck in a familiar horror film that I know the ending of. The final ramp to the top of Corabutt gap is super steep. In my lowest gear now 34 x 25. Cadence slow and power gone, I fight around a left hand turn to the summit. Wow, that was ugly. On Mt. Leinster you see the entire climb to the summit. I can everyone all stretched out ahead of me, on a long slope that bends to the right around a curving bald mountain. The view on good day must be great. Today it's all obscured by mist though: White mist from rain, and a red mist of fury in my frustrated eyes. I'm pissed off that I couldn't stay with them. Only one more day boys. The easier grade lets me get a rythym going again. I even catch a few guys near the top, good sign. My handball champ and drinking buddy from last night Johnny's also here. We fly down the descent. I'm going a lot faster. Maybe I can get back on the front group? I let the brakes go, and fly away. It's a pursuit, I'm picking off guys one at a time. There's the big strong dude with the Lucan shorts. Bunny hops over cattle grates. Careful, try not to pull a 'Phil Anderson' on the hard gravelly hard left hander, Alan said he crashed badly there in the Nissan Classic once. I hook up with another guy and we are working well together as the descent ends. We doing bit and bit to try to catch four more that are tantalizing in sight just ahead. We're not getting closer. I can't turn the big gear I need to close the gap, the legs are done now. The group is stopped ahead for a regroup. Battle over. Another welcome Jaffa cake guy ravitaillment from our Garda moto buddy. We wait, and eat. There's now a collective sense of relief, the last big difficultly of the Ras is behind us. Alan says he felt bad on the climb too, got a cold coming on. "We shouldn't have drank last night Ed. If you hadn't drank, you'd have flown up that ramp, no problem". He's quite sure. Kind words at just the right moment from a good friend who knows cycling, and knows what I'm thinking. I would have liked to have ridden for Alan back in the day, he knows just how to stoke a teammates' morale. In my heart of hearts though, I'm not entirely convinced. For the gap between cycling champions and nearly boys often feels so small you can convince yourself it doesn't exist. But just as it did at critical times throughout my cycling career, Corabutt gap revealed the hard truth about limitations. The rest of the ride is hard. I do my pulls, but mostly just suffer on the run in. The two Cat 3 climbs toward Baltinglass burn my legs. I'm climbing on Kilian's (a.k.a. Taylor Phinney Dude's) wheel. The kids long legs are still rotating whizzer fast. I'm envious, mine don't spin fast like that anymore, they muscle a bigger gear now. The kid's a great bike rider, it's been fun riding with him this week. I hope he wins a lot this season. for my glass in this Ras is way more than half full. 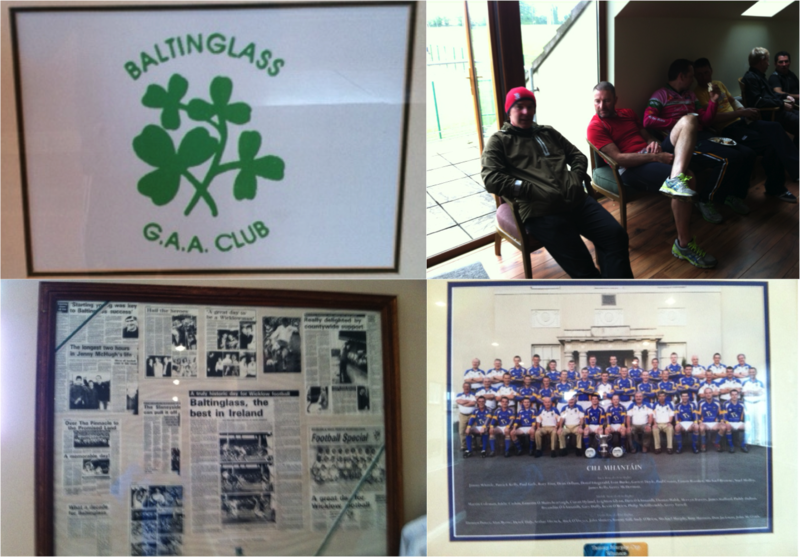 The GAA has long been the glue that holds the Ras together. 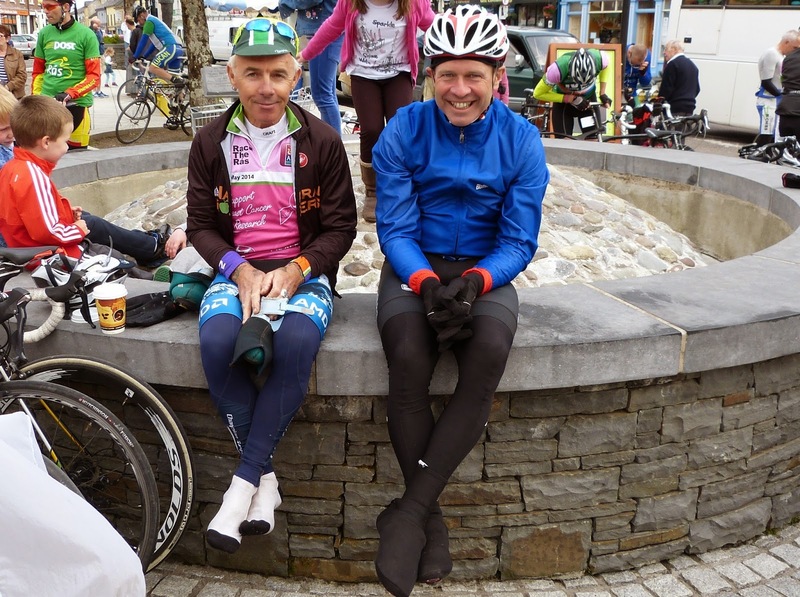 Paul relaxes in Baltinglass with ex All-Ireland GAA football star who rode with us. I met the physical challenge of doing the Ras. A few of my pals in the states bet I'd end up in the broom wagon, but I was going to complete every mile in good health, and felt better and better as it went along. 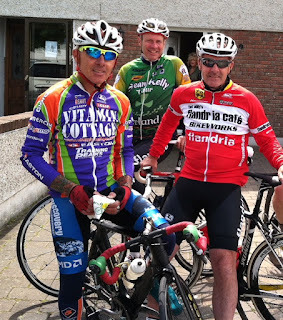 I also got to spend a week riding with Irish cycling legends, and a fantastic group of new friends. And I got to really experience my ancesteral homeland in a way few American tourists ever will. Thanks Joe Duffy, and everyone else in the organizing team for an incredible experience. For my American friends, this is what you call a good craic. The McCormack and Cassidy clans celebrate the end of the 'hard stuff' at the Louis Fitzgerald bar. Tonight is our big dinner outside Dublin. Paul's friend Philip Cassidy, and Paul's sister meet us for pre dinner drinks at the hotel. A little McCormack clan reunion. Should be a good craic. No need for major laundry tonight, just one more day. I said I would have rather rode up any mountain rather than sit in Kilkenny rail station with the biting stomach cramps. However, now I am not so sure - that sounds like the least fun of the days - but then our worst day on the bike is better than our best day in the office they say. Ha! You said it Aaron. Still, without the bug, my bet is that you would have flown up it a lot faster than me. Hope you're recovered and slaying 'em all at Wompatuck.